While traditional gardens are beautiful, a non-traditional raised bed can offer a variety of gardening choices as well as making the gardening process somewhat easier. Raised beds offer the gardener many useful options, including better control over the bed environment. Sadly, soil can sometimes become diseased or lose its nutrients. When working in a raised bed, soil can be easily removed and replaced, unlike a traditional garden bed. Another great perk is that smaller raised beds do not need to be walked on. Walking on the soil of a bed compacts it, which can hinder root growth. Weeding is also much easier, and water can be better controlled. Raised beds can be placed almost anywhere, from the backyard to a porch or patio. Since most raised beds are constructed at home, a bottom to catch soil can easily be added, increasing its versatility. However, if you do add a bottom to your raised bed, be sure to drill draining holes at the bottom to ensure a healthy soil environment. Raised beds are generally constructed of wood. Since regulations for the testing of arsenic-treated wood have been in place since 2003, all treated wood should be safe to use. While any wood can be used, marine grade plywood is often used for raised bed construction. Once a bed is constructed, it is important to consider what you put in it. 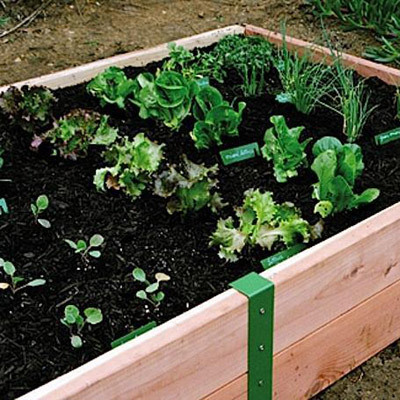 Raised beds offer more usable space than a traditional bed. Crops can be planted closer together, taking better advantage of the bed space. A typical set up generally contains one extra-large plant, four large plants, six medium plants and 16 small plants per square. With a raised bed, it is also possible to plant out and up. Depending on the plant, additional support may be needed, such as a trellis system for climbing plants like cucumbers, or support poles for tall plants like tomatoes. Succession planting is also a popular movement with raised beds, allowing the gardener to plant crops which mature early and can be harvested to plant another crop in its place. It is important to start with a good soil, then add additional nutrients like peat moss that will aid the soil in retaining moisture. Raised beds offer a variety of options that traditional beds may lack. Rather than limiting your gardening to your yard’s soil or to the backyard itself, consider installing raised beds. With placement versatility, a wide range of planting options, and more control over the plant’s soil environment, raised beds can certainly be a perfect place to grow vegetables and flowers as well as providing a relaxing outdoor environemnt. If you are considering adding raised beds to your garden, be sure to contact the garden and landscaping experts at Juniper Landscape Company. With a wide variety of design and construction services, JCMS can aid you in getting your landscape the way you want it to be, including the addition of raised beds.